four miles into the sky..."
Lex Luthor did not sleep the way most people slept. Experience had taught prison officials how unwise it was to allow their star inmate unsupervised access to tools or chemical materials of any kind. The only objects in Luthor's cell after ten o'clock lights out were a legal pad and a ball-point pen. This was a foolish precaution, of course. The prison would hold Luthor for as long as Luthor chose to be held, and not a moment longer. Meanwhile, B.J. was perfectly capable of seeing that the boss's diverse enterprises did not crumble in his absence. One night, in a loose moment, Luthor figured out how to melt the plastic cap of the pen, let a certain amount drip into the ink refill, extract a substance from the glue that bound the legal pad, wrap it all in half a sheet of yellow paper and make an explosive powerful enough to blast out a wall of his cell. Luthor would never do that, of course. If he did, the next time he was in jail the warden wouldn't give him his pen and pad. Luthor was adept at writing in the dark. He would sleep for a minute, or an hour or two, or not at all, and as an idea struck him he would scrawl it on a clean sheet of yellow paper. He replaced his pad about twice a week. This was a particularly productive night, for his cold kept him from sleeping. From the position of the full moon that shone through the window opposite his cell it looked to be about 6:10 in the morning. On the eighth page of a pad that was new when night fell Luthor drew by moonlight a sketch for a new kind of barometer whose design was based on the shell configuration of a certain extinct mollusk. Then a shadow fell over the moon. "I need your help, Lex," said the startling, reverberant voice of the shadow. "You." The reaction wasn't clever, but its tone was eloquent enough. "I've cleared it with the warden and the Justice Department," Superman explained. "We can leave immediately and the next time the Parole Board meets, your release will be granted retroactively." "What do you want me to do, microbe-head? Teach you how to tie a shoe without missing and putting your hand through the floor?" "I know. If your shoe falls off while you're flying faster than sound it could go into orbit and somebody at the Federal Aviation Administration would have to fill out a form in triplicate." "Will you calm down? There are people sleeping." "What's the matter? They're all heinous criminals. Bank robbers. Jaywalkers. Potential Nobel Prize winners. Hey, do you want to see how a Kryptonian ties his shoe?" "He does it like this." Luthor put his right foot up on his metal cot and bent over to fiddle with his left shoe on the floor. "And what's with the first names, Supe? Soup? May I call you Turkey Noodle?" "I want to know if you'll accept my terms." "I've accepted lots of your terms. A term for kidnapping. Six or eight for grand larceny. A couple for sabotage of government property." "Don't give me a hard time, Luthor. I want you to help me get the Einstein papers back." "Einstein? Didn't he play Clark Gable's best friend in Boy Next Door Saves the World? Big picture about a guy that works in a sporting goods store who finds a secret Nazi code camouflaged on sleeping bag warranty labels. You remember it." Luthor sneezed and gave Superman an opening. "All right, I've had it. This is what I want. You go with me to a planet circling Vega where the document is now, and you help me get it back. For that you get either a parole or transportation anywhere in the Galaxy you feel like settling down. Take it or leave it." "Make it a full Presidential pardon and you've got a deal." "That's a pretty stiff order." "You can do it, you're Superman." "That's true." The big man produced a document from the pouch in the lining of his cape. It was a pardon for all federal offenses—the only ones with which any prosecutor thought it necessary to charge Luthor—effective immediately. It was signed not half an hour earlier by the President and the Attorney General. "This won't change anything, you know," Luthor said. Superboy was impressed by the increasingly erratic nature of Lex's behavior even before the Jefferson-Baker Science Contest. The young hero was even more impressed, though, by the hologram project in progress and supposed that Lex's behavior was part of the pressure that comes from the process of creation. There is a high incidence of emotional instability, Superboy knew, among people in creative fields like the one Lex was clearly entering. This deviance generally comes to an end, however, when the creator is reinforced by recognition. When Lex won the Jefferson-Baker scholarship, as he inevitably would, he would once again become the old, moderately tolerable fellow that he was before he became obsessed. Meanwhile, Lex's aberrations were jarring loose the collective emotional stability of the high school. During the time Lex was building his project he evidently had some trouble creating a holographic image flawless enough to fool people who were standing nearby. His early efforts seemed as though they were flapping in the wind or rippling as if underwater. He thought at first that people might overlook poor quality if what they saw did not appear to be a person standing on a stage, but in a tank of water. One day, when Coach Norm Levine led his first period Smallville High School swimming class into the indoor pool area he saw, lying at the bottom of the pool, the figure of a young brown-haired boy in a crew-neck sweater, smiling cherubically. Alarmed, Coach Levine dove to the bottom of the pool and spent fully a minute and a half grasping at the rippling figure, trying to figure out why he couldn't get hold of it, before he found himself on his back beside the pool with one of his students giving him mouth-to-mouth resuscitation. A week or so later, in a history class, Miss Carol Roberts asked Lex Luthor what Secretary of State Thomas Jefferson's attitude was toward the Whiskey Rebellion. Lex said that Jefferson was quite adamant in the belief that the federal government should put down any local rebellions before they spread to other areas like a virus. This was, of course, precisely the opposite of Jefferson's feelings and Miss Roberts said so. "You've obviously been too preoccupied with other things, Lex, since you did not read the assignment. Is there anyone who can tell—"
"Excuse me, Miss Roberts," Lex interrupted, "but I did read the book. I read the whole book the first week of school and I remember just about everything in it." "I wish you would stay with the class, then, because you've got Jefferson mixed up with Hamilton. Is there someone who—"
"If you look in the book, Miss Roberts,"—Lex was sweet as frosted flakes—"I think you'll find that I'm right." "Lex Luthor, that's twice in a row you've interrupted me. I think I'll do just that, since you seem so intent on embarrassing yourself. Let me see, that's—"
Miss Roberts squinted, looked closer at the page and mumbled, "Jefferson couldn't have said anything like—"
She looked up and saw Luthor lose the restraint with which he had held his mouth closed, fall out of his seat and roll on the floor laughing. She sent Lex to the principal's office, looked again at the page of the text which now said something quite different from what she had read aloud, and had trouble finishing sentences for the rest of the day. Unknown to Lex, Superboy interceded on his behalf on both these occasions. Superboy even asked the principal to ignore it when, following the incident with Miss Roberts, Lex laughed uncontrollably through the first ten minutes of his half-hour detention period, stopped abruptly, mumbled something and, with a wild look in his eyes, ran home for the day. Even Superboy had trouble accepting his behavior the next day when Lex showed up for first-period algebra, red-eyed from lack of sleep. The teacher had asked Lana to do a fairly difficult problem at the board in front of the class, and when she made an error Lex jumped up and screamed something unintelligible. He pushed Lana out of his way, scribbled the solution to the problem and angrily banged a fist on the blackboard, cracking it down the middle of his equation. No one in the room knew quite what to do, so no one moved. Lex stared at all of them during a forbiddingly painful two-and-a-half seconds of utter silence and then howled, "Why do I have to put up with this crap?" He exploded into tears. Clark Kent hopped up to put a hand on Lex's shoulder. Lex hurled away Clark's hand and left the building. His parents didn't see him for two days. The story goes that Archimedes, for lack of parchment, used to work on the beach, drawing polyhedrons and circles and writing formulas in the sand. During the two days Lex was missing Superboy saw him scrawling in the sand on the shore of Stafford Pond a few miles outside Smallville. One of the two nights Lex spent there he took three hours out to sleep under a clump of bushes, but other than that he did not sleep at all. Almost catatonic, he stared at the lake for hours at a time. He paced. He banged his fists on trees. He laughed. He hid from people who occasionally came by. He cried. He drew intricate diagrams in the sand. Secretly, Superboy uprooted clumps of poison ivy from where Lex might walk in the dark, and otherwise left him alone. Superboy did not pretend to understand any of this, but he did believe that if the world was lucky, he was witnessing the blooming of a genius. Superboy did not know, Superman did not know, whether genius is a capacity with which some are born, or if it is a product of a peculiar juxtaposition of wonder and terror in a person's education and environment. Whichever was the case, it was happening here and the hero wanted to be sure the process was allowed to run its course. After the contest, Lex came back to the lake and for a week he did very little other than sleep. Lex was falling asleep, as a matter of fact, when Superboy plucked him off the beach and presented him to his new laboratory. Lex's eyes welled up, he lavished Superboy with thanks and no one saw him for another three weeks. Some of Lex's classmates and a few of the teachers he had not yet intimidated left food outside the laboratory door. Clark Kent, the only student that the Smallville High faculty trusted not to copy answers that were often more accurate than teachers' answer keys, got the job of leaving Lex's tests and homework in the laboratory mail slot. Some days the food was gone in the morning, but it generally remained. Twice during the two weeks the accumulated assignment pages were tugged in through the mail slot. The next morning, both times, they were in a neat pile, correct and completed, on the ground outside under a basket of rotted fruit. No one ever saw the door open, not ever. Even Superboy had no idea what was going on inside. He had lined the walls and venetian blinds with thin lead sheeting. For three weeks Lex was very like a mystical medieval hermit living in a cave. Legends say that the First World War was caused by the assassination of Archduke Ferdinand, that an apple falling on the head of Sir Isaac Newton brought about the discovery of gravity, that his murder of an Egyptian slave-master in an instant of righteous madness sent Moses into exile to discover the wonders of God and the desert. The world might be much more orderly and interesting if these things were so, but it is likely that they are not. It is likely that the world would have gone to war had Ferdinand lived, that Newton would have noticed gravity if he had been sitting under a flagpole, that Moses would have recoiled from oppressive Egyptian society even had he witnessed one fewer act of wanton brutality. When newspapers or magazines publish biographical profiles of Luthor the arch-criminal, when students in social studies classes discuss Superman's greatest enemy on Earth, when convicts who have served time at Pocantico talk about the singular, brooding man with the red-lit eyes, they invariably get around to telling the story of the day he decided to live outside the law, the day the laboratory burned down. Actually, it was coming for a long time. It was about ten-thirty one night and Lex Luthor appeared outside his laboratory door and yelled, "I did it!" No one was around to hear him. He had his favorite audience. "I did it, didja hear? I did it! HOT DAMN!" Smallville went to bed early. Sometimes only Superboy was awake, flying over the village, or over a nearby city, or to the moon if he felt like being even more bored. When Lex took off in a dead run across the field where his laboratory stood, tripped in a rut, rolled over and onto his feet without noticing he had fallen, screamed through the streets howling, "The gametes are coming! The gametes are coming!" Superboy was, in fact, on the moon, staring full-face into the vicious sun, wondering what it meant to be a Superboy, or some such matter teenage boys traditionally ponder. Superboy was going through the familiar identity crisis period of adolescence and was trying very hard not to bother anyone else with it. Today he would learn about guilt. Lex saw a light in the basement of Kent's General Store and pounded on the door until it opened. Lex expected to see Jonathan Kent, or Clark, being diligent about the books or the inventory or something. Instead, old Whizzer Barnes pulled the door open. "Hey there, young fella, what're you doing prowling through the streets at this hour?" Whizzer had owned the General Store before Jonathan Kent bought it. He was retired now. He hung a smile from his sagging jowls as he let Lex in. "You're Julie Luthor's boy, right?" "Yeah, yeah. I'm Lex. Is Clark around?" "I would think Clark's asleep by now, just like I'd think you ought to be. I was just puttering around in the basement looking for an old records ledger I think I left behind." "Got any beer? I've gotta celebrate." "Seems a man can't even do nothing at all if he's of a mind without some government fella asking where he made what money he's living on. You say beer, son?" "Yeah, like in the fridge or someplace? Mr. Kent must keep something like that around." Lex swung open the door of a deep freeze behind the counter and found only ice cream. "How about tobacco?" "Ain't been able to get beer in this town since nineteen and fourteen. Before Prohibition." "Yeah, a corncob pipe. Think Mr. Kent would mind if I grabbed this and paid him for it tomorrow?" "That was the year they passed the income tax. Folks thought it'd be a good way to keep away the revenuers." Lex stuffed the pipe in his pocket and clutched a two-ounce pouch of Flying Dutchman tobacco and flew out the door. "Thanks, Mr. Barnes." "Appears folks was wrong, though." Whizzer Barnes stood at the open door and stared after Lex for a long time. There was a look behind the boy's eyes he had seen only once before. He couldn't place the look until he remembered an old man who had come into this store, it must have been ten or fifteen years ago. The old man moved slowly, hardly had any cheeks for the wrinkles over his face. He had a mustache, as Whizzer recalled, and had a wool cap pulled down tightly over his head. Lex and the old man didn't move or sound or act the same. What was it about the two of them? Whizzer thought he remembered. The old man had bought a corncob pipe and tobacco too. Whizzer Barnes folded his ledger under an arm and shambled home. When Superboy entered the atmosphere of the Earth there was smoke seeping out the windows of Lex Luthor's laboratory. Four thousandths of a second later the Boy of Steel crashed through one wall of the structure he had built three weeks earlier and out the opposite wall. The fire, with room to breathe, now spat its killing heat into the open air. Superboy scooped the unconscious Lex Luthor from the floor of the building, wrapped him in his cape to extinguish the flames licking at his clothes and hair and set him down on the open field. When Lex awoke two seconds later, heaving air in and out of his lungs, he saw Superboy emptying his own lungs at Lex's laboratory, his fire, his creation. Lex raced at the falling building, howling his rage. He got far enough to feel the heat, to need to cover his mouth and nose with a hand as he ran, to feel a hot prickling sensation over his exposed skin, to see the bowlful of living protoplasm he had created with his mind and hands and livid soul die the death that Lex, at that moment, wanted to die. Searing gas from the combustion of his artificial protoplasm killed the hair follicles of Lex's arms, face and head. 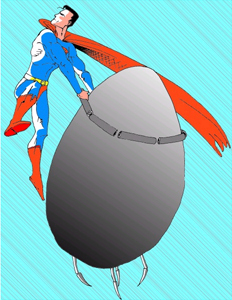 Only the hand he was holding over his nose and mouth when Superboy plucked him up, kicking and writhing, for the second time, saved the cilia in his nostrils. He would never grow hair or a beard again. He would laugh or cry or become enraged when pansy philosophers wondered, in the future, whether laboratory life could have a soul. He knew that such life would have no less than the soul of its creator. Lex Luthor chose, from the moment his creation died, to hate the being who had saved his miserable life, who was responsible for the loss of his brown curls and his child. It was the only way he could walk slowly, one millimeter at a time, from the abyss of madness. Superman came to understand, as Luthor did not, that while Luthor's soul might be as durable as that of any other creature in the Universe, the vulnerable and sensitive body of a mortal can withstand only a certain amount of greatness before it must balance that with venality. Superman occasionally thought to devise some way to give Luthor super-powers, then thought better of it. Luthor was damaged at the same time and with the same terrible efficiency that Superboy had been nurtured. Luthor had never killed a human being, had never been directly responsible for a man or woman's death. The entire mass of his hatred was directed at Superman, who was thankful to take the hatred and leave only Luthor's disdain for the rest of the human community. The Kryptonian became upset whenever he thought of the man who had been his boyhood friend. Superman could only hope that someday God would have mercy on Lex Luthor's tortured soul. The pair stood outside the walls of the prison as dawn broke, Superman telling what nothing he knew about the situation, Luthor insisting that they should go to Oric separately and that he was perfectly capable of getting there almost as quickly as Superman. For a man with an amazingly creative intellect, who had been turned out of the family by his parents at the age of fifteen, who was completely bald at thirteen, who had no formal education beyond trade school at a juvenile detention home, but who was still considered the world's foremost technical physicist, who had almost never had anyone around him intelligent enough to hold his own in conversation, let alone be his friend, and who consequently spoke to pictures and statues of dead geniuses, Luthor was scrupulously sane. When he said he could navigate a distance of 26 light-years in a reasonable length of time, Superman was inclined to believe him. On the trip to Metropolis Superman did Luthor the courtesy of wrapping him in his cape so that he didn't catch a worse cold than Superman had already furnished him. They could also make the trip faster that way. The cape protected Luthor from burning to a cinder with friction. They landed in the central courtyard of the Metro Modern Art Museum. The city was a ghost town early Sunday morning. "Do you appreciate art, Noodles?" Luthor asked as he unraveled himself from the red cape. "I think so. But my taste is a little more offbeat than these pieces." There was a big round St. Bernard with the look of a monk standing by a fountain. It was carved from redwood. There was also an aluminum rectangular prism twelve feet long and bent in three places. Its title was "Crushed Cigarette." There were several stabiles, the most interesting of which was a silver-and-black structure made from several materials. In its center was an ovular plastic bulb whose top half was clear and whose bottom half was smoky black and opaque. It was surrounded by eight coiled flat silver surfaces, each maybe thirty feet long if it were unrolled. The sign accompanying the object called it "Black Widow" and noted that the piece was on indefinite loan from the artist, one Jeremy McAfee. "There it is," Luthor swelled with unabashed pride, "my flying sailboat." "It's supposed to be lifted like a glider by a mother craft of some sort, but you'll serve the same purpose." "You're telling me that this three-dimensional test pattern is your starship?" "Well, you don't think it's art, do you? Just fly it up about twenty thousand feet and let go." Luthor pressed several unmarked points on the apparently smooth surface of the sculpture's central bulb, and the clear portion opened on a hinge like a cracked Easter egg. As Luthor climbed inside, Superman became apprehensive. "What about McAfee? He's a very well-known artist." "He's a sententious phony. If you like, I'll get a letter from him granting permission to use his sculpture for space flight as soon as we get back. The minute we touch down on Earth." "Are you telling me that Jeremy McAfee is you?" "Genghis Khan, Joan of Arc, Einstein. Do I ask you your secret identity? Everyone knows you're Morgan Edge, anyway." Superman watched himself do a double take. Superman lifted Luthor and his Black Widow four miles into the sky and let go. Majestically as a butterfly coming out of its cocoon the eight arms uncoiled as it fell. From each of their surfaces rose four triangular sails, black on one side and silver on the other, as if some old sea captain were pulling the strings all at once from outside the bottle. Everything but the pilot bubble was thinner than writing paper and as it fell, its speed approaching two hundred miles an hour, the silver sides of all thirty-two sails glowed with soaked up sunlight. Its descent slowed. Stopped. It rose. It gained speed. The arms and deceptively fragile sails railed against the rushing wind, but they held. And the wind diminished as the air thinned and the speed increased. By the time it crossed the edge of space the Black Widow flew faster than a comet. It streaked toward the sun. Within half an hour Luthor was rolling in an arc around Sol, his ship itself glowing as brightly as a tiny white dwarf with a black egg at its core. It soaked energy from the star, whipped around it like an arm winding up to a pitch. It sprung out of orbit into the northern sky as fast as a photon. As it crossed the threshold of lightspeed it entered negative space. Lex Luthor had all time and space at his disposal. What was the difference, he wondered, between himself and a superman? The last son of Krypton followed the sailing ship into the sky, fascinated as its sails swelled with solar energy and disappeared from real space. Superman followed under his own power. There was no way to say where in space he overtook Luthor, since neither was traveling in the visible Universe. They swam the catacombs of a thousand planes of existence and if during the trip they occasionally intersected with the three dimensions of their familiar perceptions it was by chance. As the first trickle of internal combustion engines began their inevitable Sunday flood over the streets of Metropolis, Superman dropped through the green skies of Oric.